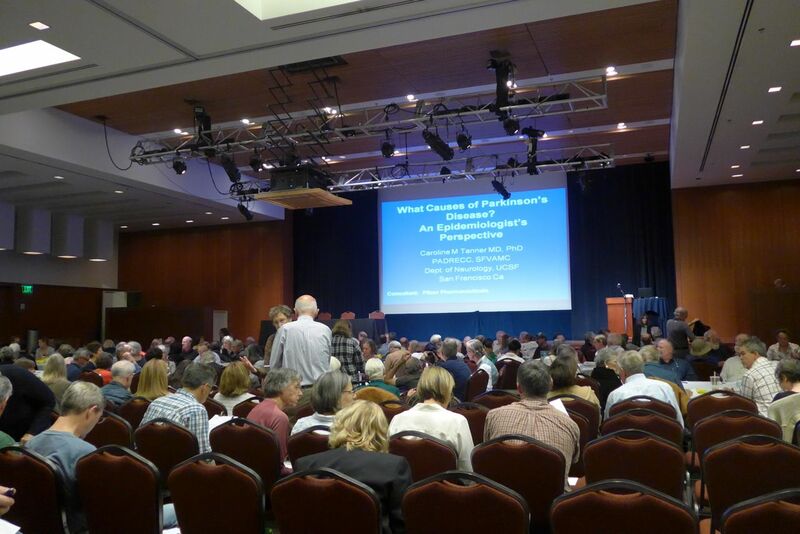 November 15 | by Darcy Blake |The University of California, San Francisco (UCSF) Parkinson’s Disease Clinic and Research Center presented their sixth annual conference at UCSF Mission Bay Campus, William J. Rutter Center in Robertson Auditorium. The program began with a welcome from Michael Aminoff, MD, DSc, FRCP, Distinguished Professor of Neurology & Director of UCSF Parkinson’s Disease Clinic and Research Center. Dr. Aminoff thanked sponsors including Teva, National Parkinson Foundation, and Medtronic, and individuals including Aaron Daley, MA, Administrator and Research Coordinator, Parkinsons’s Disease Clinic & Research Center and Ariane Marcus, Clinical Research Assistant at UCSF for their effort in presenting the event. Caroline Tanner, MD, PhD, PADRECC Director, Professor of Neurology spoke on the “Epidemiology of Parkinson’s disease.” Dr. Tanner, on the UCSF staff, is also on an advisory board of the Michael J. Fox Foundation. Her prolific studies examine the patterns and populations of people with Parkinson’s disease. She stated that with more research on the PD community, we can find better treatments. Elements that help curb the disease? Moderate exercise, coffee/tea, and vitamin D have been considered. She recommends a dynamic multi-disciplinarian approach: participate in Parkinson’s Progressive Markers Initiative (PPMI) funded by the Michael J. Fox Foundation to set biomarkers, and get out in the sun for exercise. Donna Deng, MD, Associate Professor of Urology asked “How does Parkinson’s disease wreak havoc on your bladder?” Deng, a charismatic speaker, was perfectly at home discussing the bowels of a person with PD. 50% have irritation symptoms, 25% have obstructive symptoms, and 25% have both symptoms. These unpleasantries appear after people experience trouble with the typical symptoms. “Something you don’t want to share at dinner parties,” she smiled. After explaining slow sphincter control, and impaired contraction of the bladder, she cited new aids including a bladder pacemaker, sacral nerve modulation (a type of DBS for the bladder that includes a wire inserted into your tailbone) and botox injections, coveted by satisfied patients who are eager to repeat them every six months. The trick is to zone in on the specifics with a professional to determine the best treatment for your problem. Chad Christine, MD, Associate Professor of Neurology spoke on “Established and Emerging Treatments for Parkinson’s disease.” He covered tons of new information in a very short time. On the subject of stem cells, he reported there were no recently published studies in humans, and he included that surgical injections have limitations. He reviewed new treatments in the works like gene therapy at phase one and two levels, and an infused glial cell line pump at the phase two level in England. Droxidopa, a drug that has been specifically designed to combat the symptoms of low blood pressure has been approved by the FDA. This approval may be good news for PD patients suffering from low blood pressure, dizziness, and passing out (syncope). Jill Ostrem, MD, Professor of Neurology spoke about “The Role of Deep Brain Stimulation in Parkinson’s disease.” It is hard to imagine a more fact-filled presentation on Deep Brain Stimulation. Everyone in the audience, by her call for show of hands, had heard about this treatment, but there was plenty to review. Reasons why you might consider it? you’re an exception (possibly with tremor) who doesn’t fit in the above. After an example of a typical workup, she reviewed what DBS does and doesn’t help. For instance, tremor is helped, but swallowing and speech are not helped. She stressed that DBS is complementary to meds, it is not necessarily a substitute to meds. There’s new DBS on the horizon that UCSF’s Dr. Starr is working that includes a smart DBS as opposed to continuous open loop DBS. There are new device companies surfacing including Boston Scientific that offers 8 electrodes and rechargeable battery reported to last longer than 9 years. In conclusion, one of the most bizarre stories of the day involves the Twiddler syndrome. That’s an infrequent but potentially dangerous complication of device therapy. The syndrome results from the manipulation of the implanted pulse generator device in the chest by the patient, leading to traction and subsequent lead dislodgement. Originally described as a complication of pulse generator implantation, it has been increasingly reported as self-induced, with the patient turning the pulse generator multiple times. Ouch!